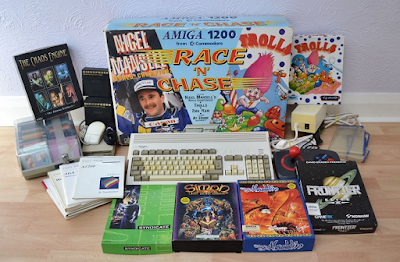 Despite a minor problem in its video output that should be easy to fix and maybe even attributable to the video cable itself, this Amiga 1200 currently up for auction on eBay is a fine opportunity to grab Commodore's excellent 32-bit micro. The computer comes in its Race 'N' Chase box, with all the manuals, a joystick, lots of disks, power supply, cables, and an incredibly handy external disk drive. Oh, yes, and an awesome collection of six boxed games including Syndicate, The Chaos Engine, Simon The Sorcerer and Frontier Elite II.